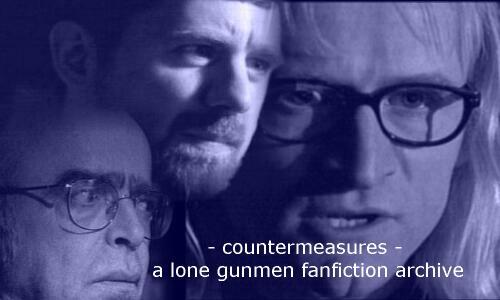 CounterMeasures came to be in late April of 2001, during the short first (and only) season of the television show, The Lone Gunmen. Its name comes from the X-Files season 4 episode "Musings of a Cigarette Smoking Man". The purpose of the site is to archive fanfiction featuring the original characters John Byers, Melvin Frohike, Richard Langly, Jimmy Bond, and Yves Adele Harlow. Fanfiction archived here need not be set in the universe presented only in The Lone Gunmen; original fanfiction set in The X-Files universe is also archived, as long as the characters mentioned above are featured somewhere in the story. All characters are copyright of Ten Thirteen Productions and Twentieth Century Fox. No infringement is intended. All works archived at this site are done so by permission only. The archive was originally built on Geocities by Maidenjedi. When Geocities closed their free site hosting in October 2009, I got permission to move this site to a new home. I hope to add more stories in the future, so if you know of one which belongs here but isn't, or if you find any problems with the site on your travels, please email and let me know. Photos used in the graphics on this site were originally captured by Megan of ROAD Runners, and the main graphics contain captures from the LGM episodes "All About Yves" (Byers), "Planet of the Frohikes" (Frohike and Yves), "Like Water for Octane" (Langly), and "Tango de los Pistoleros" (Jimmy). The Lone Gunmen and all its characters are copyright Fox Entertainment and 1013 Productions/Chris Carter. This is an unofficial site and has not been approved by FOX Entertainment. This site is for the fans and is for entertainment purposes only. There are no plans of copyright infringement on our part. All stories archived belong to their respective owners. Please do not reproduce without permission.